Here is another Farbenmix Dress I just finished. It has a little kitty appliqued on it from Designsbyjuju.com. I also added a couple of flowers from lynniepinnie.com to “tie” it in a little better with the flower material used on the overskirt. Eliana LOVES this dress. She does not want to take it off – she even wants to go to sleep with it. It certainly makes sewing more fun when the grandkids actually enjoy it! 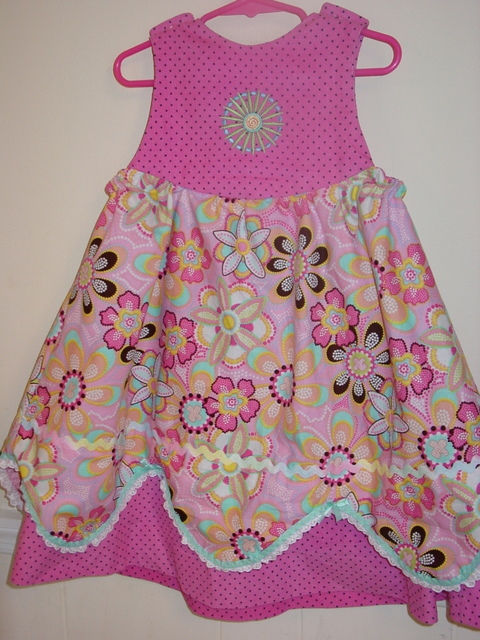 :) The dress is made out of corduroy (black dots on pink) and the overskirt is a Moda Pink Carnival Bloom cotton. 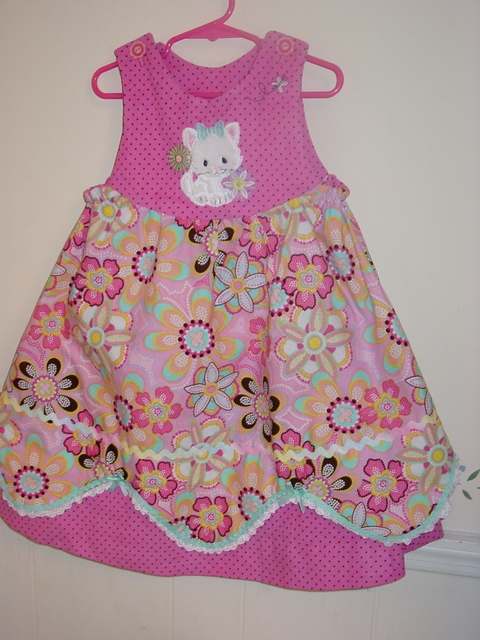 Again, as usual, Farbenmix’ patterns sew up like a dream. 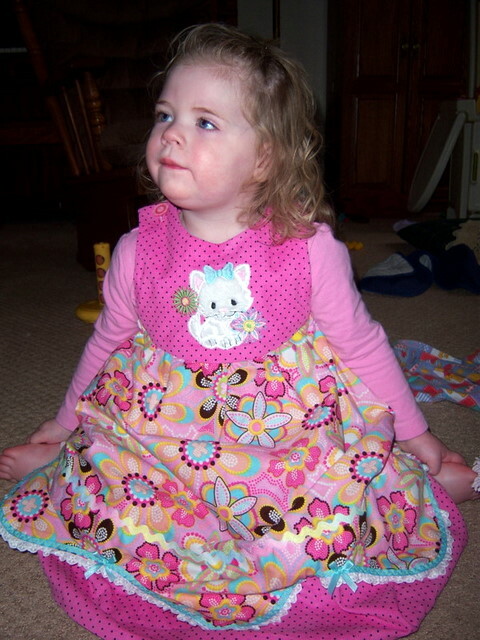 I couldn’t be happier and am sure to make more of this pattern for Eliana. It really “fits” her personality. I think it would look cute as a tunic over little pants with ruffles. Eliana is a very charming little one – she has learned to nod affirmatively and shake her head for “no”. Sometimes I wonder why I don’t get an answer from her and she just stands there silently nodding her head. What a little cutie pie. She is also very enthusiastic and very bright and inquisitive. I feel very privileged to be watching her and seeing her up close. I thank God for the blessing of Grandchildren. Can you tell me which Farbenmix pattern this is? I absolutely agree – this is an adorable dress! But I am having a problem figuring out which one it is! It’s “Cara” – I LOVE this pattern. It’s easy to make and it has become Eliana’s favorite. You can also make it as a top with just the scalloped overskirt. Looks darling with capri pants for the summer. Please see my entry about discount priced patterns through Yahoo. They are $6.50 or so per pattern. I am not associated with that yahoo site in any way – just very happy to have found it.